Lefroy to the east and to the Blue Tier. 1. Cleveland to St Helens line. A Telegraph Office was opened at Cleveland in 1876 on the main Hobart-Launceston line just north of Conara and Campbell Town. Cleveland had been established as a coach stop in 1842 and there were plans to develop it into a major centre along the road but its poor environment halted these plans. Nevertheless, Cleveland was a popular spot for bushrangers - possibly another motivating factor for opening a Telegraph Office there. About 1874, it became clear that it was desirable to develop a telegraphic link to Georges Bay (with a change of name to St. Helens in 1882). A whaling station had originally been developed there but, after the discovery of tin in early 1874 at Blue Tier, Georges Bay became a shipping port for the mines. In 1874, telegraph wires began to be constructed from the main Hobart-Launceston line just south of Cleveland at Conara to the east through the Fingal district. The Fingal Valley was the shortest route to the east coast and allowed for easy construction. In 1876 Telegraph Offices, were opened at Avoca, Fingal, St. Mary's and Falmouth. All four towns had well established postal services. All had developed economically especially through farming. For example, Fingal began in 1827 as a convict station but grew dramatically, albeit briefly, after the discovery of gold in 1852 at Mangana 10 km north-west. This discovery is widely regarded as the first discovery of payable gold in Tasmania. From 1877, coal mines were opened at Cornwall just to the north-east of St. Marys. The telegraph line from Falmouth was constructed to the north and a Telegraph Office opened at Georges Bay (St. Helens) in 1876. 2. St Helens to the Blue Tier. Due to the tin discoveries in the Blue Tier, a telegraph line from Georges Bay into the western part of the Blue Tier at Moorina was constructed with a Telegraph Office opening at Morina on 1 January 1877. Weldborough (7 miles from Lottah). It is widely recognised that Weldborough was the largest Chinese community on any tin field in Australia. That community even outnumbered the Europeans. They were brought in as cheap labour as the Tasmanian miners, who were paid 12/- per week, wanted a wage rise to 8/- per day (which they finally won). The line from Moorina also linked in 1885 to the north-east to Gladstone and to the south-west to Branxholme (see below). 3. 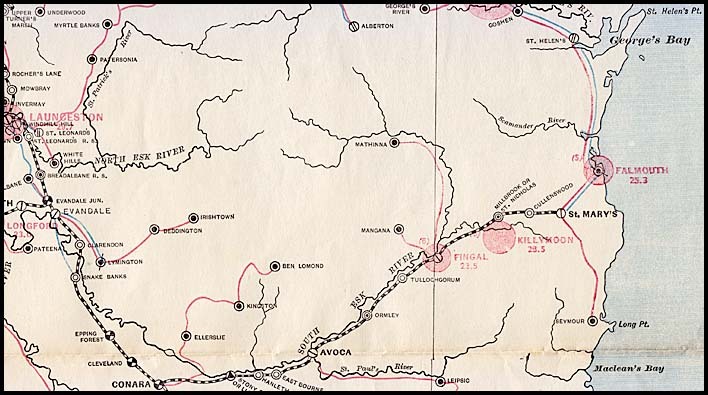 Lefroy to the east and the Blue Tier mines. As early as the 1840s - well before the gold rushes in Victoria and New South Wales, it was known that there was gold around Nine Mile Springs - which changed its name to Lefroy in 1881. The gold deposits were confirmed by further finds in 1857, 1858, 1863 and 1869. In 1870, the first mines were established and a period of "boom and bust" commenced. Dozens of mine shafts were sunk to great depths (up to 360 m) in the general area. A Telegraph Office was established in 1871 at Nine Mile Springs to service the growing number of prospectors. Walch's Almanac for 1871, lists Nine Mile Springs as one of the 13 Telegraph Offices established by that year. The Journals of the House Assembly, Vol 22, p. 129 show the contract for the Registrar's hut and the Telegraph Station was signed on 22 November 1871 for a cost of £100 10s 6d. During the third period of development, the Telegraph Office at Nine Mile Springs changed its name to Lefroy in 1881. The Mercury published an excellent account of a day's visit to Nine Mile Springs from Launceston in 1880 which briefly references the Telegraph Office. It shows certain differences from the less adventurous half hour journey of today. Following the establishment of the gold-mining operations, tin - referred to then as the grey gold - was discovered in the district in 1874 around Gould's Country (Kunnarra) at the foot of the Blue Tier. at Lower Junction to the east. Prospectors came from the goldfields to Georges Bay (St Helens) and then walked two days to the Blue Tier. The tin ore extracted from the mines was exported from Georges Bay. A telegram with comment elaborating on the nature of a major tin find was published in The Mercury on 5 April 1881 (page 2). "I have to chronicle another case of stealing tin ore belonging to the Waratah Tin Mining Company. It appears that the person that packs the tin out has been in the habit of storing it in an empty shop, and the thief or thieves got in through through the window, where there was a pane of glass out. They then abstracted 10 bags of tin, and no trace of it can be found anywhere, although the police were quickly on the spot. The windows are now all barred up with paling - a case of lock the stable door after the horse is stolen. Licensing day is drawing nigh, and there are two residents here who intend to apply for a publican's license; both are making improvements to their places. How one expects to get a license granted to him I cannot say, for he has been twice convicted of sly grog-selling and the last time fined £100 and costs". In 1882, major activity to construct telegraph lines occurred generally in the north-east of Tasmania but especially to service the tin mining in the Blue Tier. 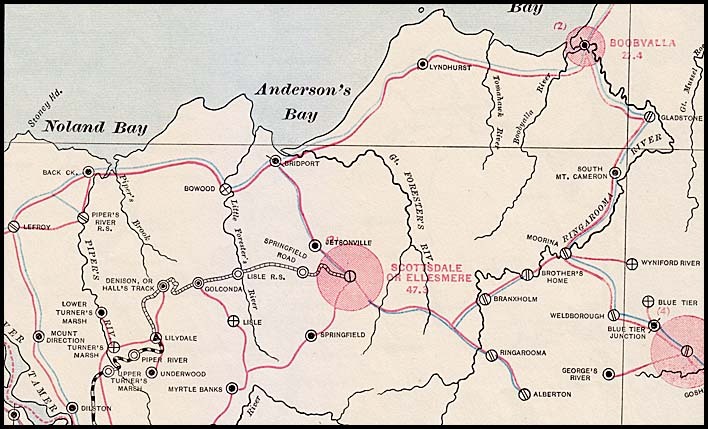 a second line to the north was constructed from Lefroy to Low Head anticipating the additional traffic which would flow between Low Head and the Blue Tier area. a line to Bridport from Lefroy (as it was called by then) was also constructed and taken immediately to the south to Scottsdale (an important agricultural centre close to the Tin mines) and then further to the south-east to Ringarooma. In 1885, the line was extended from Ringarooma south to Alberton. Also in that year, a link was made from a point between Scottsdale (Ellesmere) and Ringarooma to Branxholm and through to Moorina. These developments were very fast - Branxholm had only been proclaimed as a town in 1883 (although it had a Post Office since 1876 - which was merged with the Telegraph Office in 1885). 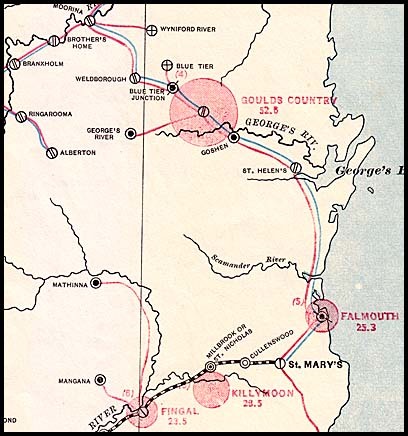 It was presumably considered more economical to use this route possible because of the dense forest between Ringarooma and Weldborough. the line which had been taken to Bridport was extended east to the important shipping port of Boobyalla and then down to Gladstone. That linked soon after to Moorina which completed a circuit back to Lefroy. Also in 1885, a Telegraph Office was opened at the change-of-gauge town of Evandale (which used to be named Western Junction) and at Lymington (so during the years before its name changes began).